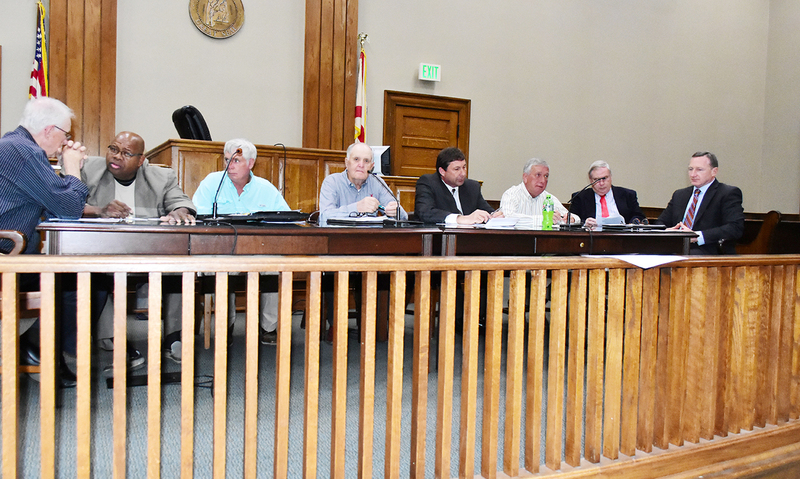 Shown at the March 25 meeting of the Fayette County Commission, from left, are: Commissioners Joe Acker, John Underwood, Billy Joe Rodgers, James Knight, Shane Hughes, Barry Corkren, County Attorney Allen Grocholski and Fayette County Probate Judge (Commission Chairman) Mike Freeman. The Fayette County Commission voted to hire a part-time aging director during its March 25 meeting. All commissioners were present for the meeting. The commissioners approved a motion to enter an executive session at the beginning of the meeting to discuss personnel issues at the request of Commission Chairman Mike Freeman. Following the executive session, Freeman announced that the county road supervisor, Tim Whitson, had resigned from his position effective immediately.